Recent scientific research into psychedelic mushrooms, and their main psychoactive component, psilocybin, has revealed that a host of potential lasting medicinal and therapeutic benefits are attached to the psychedelic experience that psilocybin provides, beyond the trip itself. A few carefully structured psilocybin trips can help a person in a multitude of different ways, including quitting smoking, and overcoming alcohol addiction. As well as the groundbreaking study on psilocybin in the treatment of depression, researchers have shown that psilocybin could also be used to treat anxiety suffered by people with terminal illness. Administering psilocybin as a palliative treatment significantly reduced scores of anxiety and depression in these patients, and the positive effects lasted six months or more. Psilocybin’s effects on the default mode network (DMN) have also been investigated in the treatment of obsessive compulsive disorder (OCD), where an overactive DMN is considered to be a factor in the symptoms of the condition. One study showed that a single dose of psilocybin, given to nine sufferers of OCD, significantly reduced symptoms for at least a day following the treatment. Psilocybin also has been shown to have significant benefit in the treatment of cluster headaches, a debilitatingly painful condition with very few effective medications. Nearly 50% of cluster headache sufferers who used psilocybin described it as more effective than traditional treatments at preventing cluster episodes. All of this research, regardless of its focus, comes together to produce one clear message: psychedelics are powerful, and can transform your life. Indeed, it is this increasingly strong evidence-base for its benefits that has helped transform psilocybin from a banned substance to an FDA-approved medicine: trials which are set to render it available as a prescription-based panacea for treatment-resistant depression are currently underway in Europe and North America. At Synthesis, we follow developments in clinical research into psilocybin closely, to ensure that the atmosphere we craft for our guests at the Lighthouse maximises the positive impact of their experiences with psilocybin. From the inception of the retreat, the Synthesis team have been aware of the immense value of collecting data surrounding the psilocybin ceremony that we provide, to document the lasting positive impact which attending a psilocybin retreat such as ours can have on the outlook and wellbeing of an individual. At Synthesis, we go beyond clinical research, focusing on the relationship between responsible, intentional psilocybin use and meaningful experiences for people who are seeking personal development and transformation. Our retreats take place in a luxurious private apartment complex called the Lighthouse, surrounded by the beauty of rural Amsterdam. This idyll is ostensibly a world away from the stark, hospital settings that are producing the current groundswell of scientific research into psilocybin. However, in designing our retreat, we have drawn extensively on the study protocols that underpin academic psychedelic research. This includes, for example, offering the participants on our private retreat the chance to be individually supervised by a dyad of expert guides during the ceremony itself; a standard clinical practice in psychedelic psychotherapy. The purpose of weaving current clinical practices into the heart of the way we craft our guests’ time at Synthesis is to curate the kind of psychedelic voyage that is most likely to allow them to reap the scientifically evidenced benefits of psilocybin. Namely, increased mental wellbeing, reduced depressive and anxious thinking, positive personality changes, and the potential for mystical experiences. Synthesis has collaborated since its outset with the pioneering Psychedelic Research Group at Imperial College London to collect data from our guests, with a specific focus on examining how psilocybin can bring about positive changes in personality and increased wellbeing. Between April and December 2018, participants at every Synthesis retreat could opt to take part in Imperial’s Ceremony Study. This involved answering questionnaires at six different points in time; before, during and after attending the retreat. Most crucially, we were able to investigate whether our guests sustain an elevated sense of wellbeing after attending our psilocybin ceremony, with follow-up questionnaires given at two and four weeks after it takes place. Although it will be necessary to refine our methodology in our future research, our initial findings are very promising. On average, 4 weeks after attending the ceremony, participants demonstrated a 10% increase in wellbeing, going from below to above average, in comparison to the general population of England. Our participants also showed a 42.4% reduction in depressive symptoms. Their rated levels of connectedness with themselves, others and the wider world more than doubled, and they continued to show a reduction in fear and stress responses compared to their baseline levels, i.e. two weeks before attending the retreat. A greater sense of agreeableness and an increased sense of connection to the natural world were also evidenced across the board. The initial findings from our data collection at Synthesis echo the recent positive findings on the potential of psilocybin to increase wellbeing from flagship academic studies worldwide, including research from the pioneering Johns Hopkins Psychedelic Research unit on the lasting prosocial behaviours and increases in wellbeing that are occasioned by having mystical-type experiences with psilocybin. We are on the cusp of a new era of psychedelic integration into mainstream consciousness. While the proliferation of studies on psilocybin is increasing, scientifically recognised data collected outside of these contexts, i.e. data collected at retreats, remains rare. We relish the important part that the findings from Synthesis can play in advancing global recognition of the growing demand for safe, legal psychedelic experiences. As the evidence base for the therapeutic potential of psychedelics grows, it inherently strengthens the case for making safe spaces for psychedelic transformation more readily and widely available. We look forward to our continued contribution to this process. To read about these results in more detail, see our report on our guests’ data, as used in the Ceremony Study at Imperial. Our focus on clinical research helps us understand how to harness the transformative power of psychedelics, so that we can offer tailored transformative journeys to people seeking to make formative life-changes. If you’re feeling an increasing pull towards your next great adventure and a yearning to evolve, fill out our application form now! The Psychedelic Research Group at Imperial College, London is conducting pioneering research into psilocybin-assisted therapy as a treatment for depression. (See their paper on their 2017 brain-imaging pilot study on psilocybin for treatment-resistant depression, and their six-month follow-up study on psilocybin with psychological support, in which participants’ depressive symptom scores remained significantly reduced). In fact, Synthesis retreat participants who opt in to provide their data for Imperial’s Ceremony Study are given the same Quick Inventory of Depressive Symptomatology (QIDS) questionnaire which is used to document the lasting reductions in depressive symptoms which psilocybin-assisted therapy can bring about in clinical studies. It is important to note that everybody is affected by depression, to some degree. Everybody who takes the QIDS test will get a depression score, regardless of whether they have (or would be given) a clinical diagnosis of depression or not. Possible QIDS results range from the lowest scoring category of no depression, through to mild, moderate, severe, and finally, very severe depression. Our guests complete the QIDS questionnaire two weeks before the psilocybin ceremony, and then again at two and four weeks afterwards, as part of our overall approach to scientifically measuring the potential improvements in wellbeing that our retreat can effect. Importantly, our participants’ scores in the Warwick-Edinburgh Mental Wellbeing Scale (WEMWBS), were raised from below to above the national average in the United Kingdom after their psilocybin experience, and remained so at the four-week follow-up. Unfortunately at this point in time, we can not accept anyone with a clinical diagnosis of depression, and, correspondingly, our participants’ baseline QIDS scores are usually low. Nevertheless, echoing the findings on the lasting positive effects of psilocybin from the Imperial team, the guests at Synthesis experienced a sustained reduction in depressive symptoms. At the two- and four-week follow-ups after their psilocybin ceremony, their QIDS scores remained significantly lowered, compared to their scores before attending the retreat. Dr. James Fadiman’s pilot study from 1966 evaluated whether the use of a psychedelic substance in a supportive setting leads to the improvement of performance in solving professional problems. The participants of the study consisted of 27 male subjects, engaged in a variety of professions. There were sixteen engineers, one engineer-physicist, two mathematicians, two architects, one psychologist, one furniture designer, one commercial artist, one sales manager, and one personnel manager. Nineteen of the subjects had no previous experience with psychedelics. Each participant was required to bring a professional problem they had been working on for at least three months, and to have a desire to solve it. Each group of four subjects met for an evening session, several days before the experiment. They received instructions and introduced themselves and their unsolved problems to the group. Approximately pencil-and-paper tests were also administered, lasting an hour in duration. At the beginning of the day of the experiment session, subjects were given 200 milligrams of mescaline sulphate. After the initial tests, subjects had four hours to work on their chosen problems. After the working phase, the group would discuss their experiences and review the solutions they had come up with. The participants also reported experiences of enhanced functioning, including: low inhibition and anxiety, capacity to restructure problem in broader context, enhanced fluency and flexibility of ideation, heightened capacity for visual imagery and fantasy, increased ability to concentrate, heightened empathy with external processes and objects, heightened empathy with people, subconscious data more accessible, association of dissimilar ideas, heightened motivation to obtain closure, visualizing the completed solution. This experiment had no control group, meaning that we can’t say for certain whether the psychedelics in this study objectively improved the capacity for problem-solving. Nevertheless, the participants undoubtedly found the experience helpful in aiding their creative process. This study paved the way for future investigations into the creativity-enhancing potential of classic psychedelics. Roland Griffiths and his team at Johns Hopkins carried out a breakthrough study showing the relationship between psilocybin use and mystical experiences. This double-blind study evaluated the acute and longer-term psychological effects of a high dose of psilocybin relative to a comparison compound. The psilocybin was administered under comfortable, supportive conditions, much like the environment we create at Synthesis. The participants were psychedelic-naïve adults, reporting regular participation in religious or spiritual activities. Two or three sessions were conducted at two-month intervals. During the psilocybin session, study participants were encouraged to close their eyes and direct their attention inward. Immediately afterwards, study participants completed questionnaires assessing drug effects and mystical experience. They completed a similar survey two months after the initial sessions. After the two month mark, study participants rated the psilocybin experience as having substantial personal meaning and spiritual significance and attributed sustained positive changes in attitudes and behavior to their psilocybin experience. When administered under supportive conditions, psilocybin occasioned experiences were very similar to spontaneously occurring mystical experiences. It’s not just religious people who experience mystical effects from psilocybin. Other studies by Roland Griffiths have shown that the therapeutic benefits of psilocybin are directly linked with the intensity of the mystical experience it induces – in the treatment of both depression and tobacco addiction. In other words, the more mystical the experience, the greater the healing benefits – even in non-religious people. Psilocybin has been shown to induce powerful, personally meaningful spiritual experiences, that stay with you long after the session. Psilocybin’s potential for personal transformation is clear when administered in a supportive and guided environment. This mystical experience is what we aim to provide at Synthesis, by providing the ideal setting for meaningful spiritual experiences with lasting benefits. One of the most famous recent studies into psychedelics examined the effect psilocybin had on the brains of volunteers, using high-resolution brain imaging. A key finding of this study was that psilocybin has a dramatic effect on the default mode network, or DMN. This is a system responsible for self-reflection and rumination (among other things). Although the DMN holds an important role in our everyday consciousness, its hyperactivity has been linked to depression and anxiety. 12 patients with severe depression were recruited in a study using psilocybin-assisted therapy. The participants went through two therapy sessions, lasting several hours each; the first with a 10mg dose of psilocybin, and the second with a 25mg dose. At both one week and three months after treatment, depression scores were compared to those before the therapy. Brain imaging analysis was also carried out before and after the psilocybin sessions. 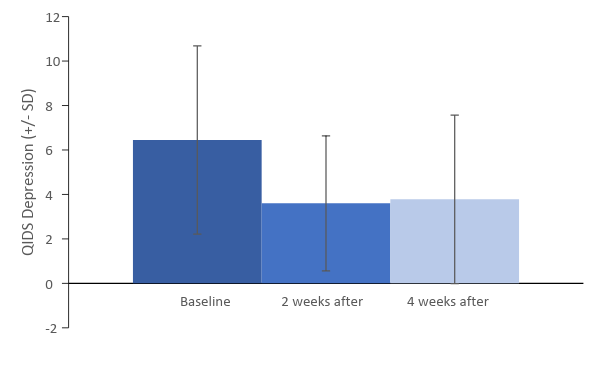 Providing these depressed patients with psilocybin-assisted therapy reduced their depression scores (measured by the Quick Inventory of Depressive Symptoms questionnaire) by more than half – and this reduction lasted for at least three months. This magnitude of reduction in the QIDS score is highly unusual for a single treatment session. Additionally, brain scans revealed that the DMN had been significantly affected by the psychedelic-assisted therapy. Psilocybin appeared to be “resetting” depressed patients’ brains by turning the DMN off and on again. What do these results in depressed patients mean for the average person interested in the transformative power of psychedelics? Temporarily releasing the brain from the control of the DMN can do more than treat depression. According to the "entropic brain" theory, deactivation of the DMN pushes the brain towards a less organized, less constrained state of being. In other words, more unusual connections can be made between areas of the brain that are normally kept separate. This means that psychedelics allow us to reach states of consciousness more similar to dreaming and creative thinking. From what we know, the DMN is partly responsible for restraining creativity during your normal life, enabling you to focus on important “follow-the-rules” tasks. But if you really want to unleash your creative side, psychedelics will help to release the control of the DMN over your brain. The results of these studies show how psychedelics could break you out of a normal mode of thinking, helping you think outside the box and change the way you process the world. At Synthesis, this facet of the psychedelic experience is fully harnessed to produce truly unique states of mind. Psychedelics are famed for their potential to bring about personality changes. We’ve all heard of the stereotype of a straight-laced accountant taking a dose of ayahuasca and becoming a yoga teacher in Barbados. Although psychedelics are unlikely to change you beyond recognition, they can certainly produce positive changes in some personality traits. Here we cover three experiments dealing with psychedelics and personality change. Katherine MacLean, Matthew Nour, and Matthias Forstmann all lead studies into the effects that a psychedelic experience can have on core personality traits such as openness, empathy, and nature-relatedness. In the MacLean’s study, participants took part in a high-dose psilocybin session, and changes in core personality traits were measured. In the latter two studies, surveys measured participants’ personality scores and related them to reports of past psychedelic use. The Results: In MacLean’s study, a single high-dose session with psilocybin produced a dramatic increase in the personality trait of openness – meaning sensitivity, tolerance and acceptance – and this change remained significant one year after the dose. The results of the surveys (by Nour and Forstmann, respectively) showed that people who had had intensely meaningful psychedelic experiences were more likely to have liberal political views, display traits of openness, and appreciate nature to a greater extent. These studies, being well controlled and designed, suggest that taking psychedelics can significantly change personality traits, and produce more compassion, empathy, and connection to nature. At Synthesis, we believe that these personality changes can significantly benefit the psychedelic user, making for a happier, more self-actuated person. Read the mainstream media’s take on psychedelic research in “The Trip Treatment” - an editorial in the New Yorker. Follow the latest developments in psilocybin research by following the Psychedelic Research Group at Imperial College London. Even in non-ideal environments, psilocybin can have profoundly transformative effects. Hear about one journalist’s experience with a makeshift psilocybin retreat in Vice. Journalist and author Michael Pollan describes a beautiful and meaningful psilocybin journey in this excerpt from his book, published in The New York Times.